The president’s children have spent their lives as his underlings in his various business enterprises. WASHINGTON — President Trump trained his rhetoric against the Bush and Clinton dynasties to win the White House, but a fresh spate of controversies highlights how an extraordinary reliance on his own family members has surpassed the sort of political blood ties he denounced on the stump. His son Donald Trump Jr., who helps run the Trump real estate empire, and his son-in-law, Jared Kushner, a key White House adviser, have emerged as focal points of investigations into Russia’s meddling in the 2016 election. His daughter Ivanka, who also has a White House office, drew fire for standing in for Trump and taking his seat at a conference table with other heads of state at the G-20 conference in Germany on Saturday. Their entanglements and controversies have been magnified both by their inexperience in government roles and by their continued, heavy influence on Trump’s political operations. The news Tuesday about Donald Trump Jr.’s e-mail about a June 2016 meeting saying he would “love’’ Russia’s assistance for his father’s campaign — in the form of dirt on Hillary Clinton — further inflamed the scandal over possible collusion. The e-mail chain also revealed that the younger Trump and Kushner were made aware in advance that they would be meeting with a Russia government lawyer to discuss Russia’s desire to help the Trump bid. Both have retained lawyers as questions swirl about their contacts with Russians. Trump’s enemies are having a field day, gleefully painting him as hypocritical for failing to “drain the swamp’’ of Washington influence as he promised during the campaign. Instead, they argue, he has elevated family members at the expense of public-service experience and adherence to strict ethical standards. He also has blurred the lines between his family real estate empire and White House roles by failing to completely disentangle his financial interests. According to Richard Painter, an ethics lawyer under Republican President George W. Bush, Donald Trump Jr.’s meeting with a foreign official in hopes of getting damaging information about someone vying to be the next president could be considered criminal behavior. Last week, the director of the Office of Governmental Ethics resigned from the White House in frustration, saying he had never seen an administration disregard standards to guard against nepotism, conflicts of interest, and professional ethics in such a fashion. The former director, Walter Schaub, is set to join the Campaign Legal Center, a Washington nonprofit office that advocates for higher ethical standards for lawmakers. White House officials have tried to frame Trump’s active family as a positive for the country. As is often the case with the administration, officials accuse the news media of treating Trump’s adult children unfairly. Over the weekend, the US ambassador to the United Nations, Nikki Haley, defended Ivanka Trump in a cable news interview, saying she “sees herself as part of a public servant family” and thus her presence at the G-20 summit was acceptable. In February, White House adviser Kellyanne Conway was admonished by Schaub’s ethics office after she encouraged Americans to buy Ivanka Trump’s clothing during a television appearance. For Kushner, Trump’s son-in-law, it is a second meeting with Russian officials that is drawing extreme scrutiny. Earlier in the year, reports revealed that Kushner had failed to disclose a transition meeting with former Russian ambassador Sergey Kislyak. After that meeting, Kislyak told Moscow-based Russians that Kushner was trying to set up a secret, secure back channel so Trump officials could communicate with Russia without the knowledge of US intelligence agencies. Historians said Trump is hardly the first president or presidential candidate to rely on family members, but there are some unique elements in this administration. President John F. Kennedy appointed his brother Robert to be attorney general — but Robert Kennedy was an accomplished lawyer who was confirmed by the Senate. Bill Clinton leaned on his wife, Hillary Clinton, to help frame and craft policy on issues such as children’s health insurance. In Trump’s case, the advisers are not a spouse or a sibling, but adult children who have spent their lives as their father’s underlings in various family business enterprises. 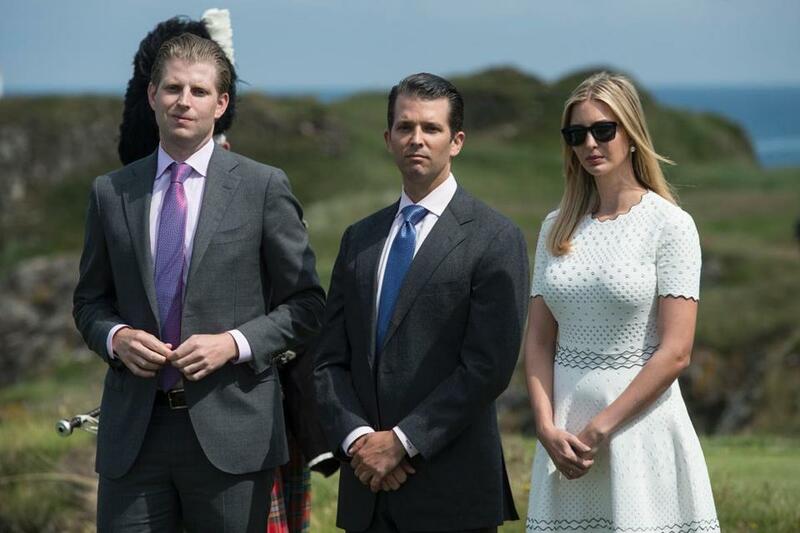 Julian E. Zelizer, a presidential historian and professor at Princeton University, said the Trump family dynamic is unprecedented in the American executive branch, considering their vast personal wealth and Trump’s chaotic governing style. On the one hand, Kushner and Ivanka Trump are merely listed as advisers, and Donald Trump Jr. does not even work in the White House. However, because Trump is known to highly value personal loyalty, the family seems to have an outsized role in influencing the president’s decision-making, Zelizer said. “The looseness by which he runs his White House, just like he run his campaign, might give more room to his family to be influential beyond their formal roles,” Zelizer said. “There’s more chaos and more fluidity in how decisions are made, which are different than the other examples,” he said. Zelizer pointed to Kushner’s role as Middle East peace envoy as evidence the Trump family holds more formal responsibilities than does a typical White House adviser.